Our adoption journey began in the fall of 2006 when we initiated paperwork for a “healthy” infant adoption from China. Like so many other adopting families, the drastic increase in wait times inspired us to check out China’s special needs program. After some prayer and research, we filled out a very conservative list of needs we would be willing to consider. In all honesty, we found the special needs matching process to be very difficult. Different kids on the list tugged at my heart or Mike’s heart individually, and we were so frustrated that what we had hoped would be a very clear- even fun- journey was turning into a lot of confusion and discord. On the few occasions that we agreed about interest in a particular child, we called our agency only minutes after another family had already placed the file on hold. The whole process felt murky and heavy. When we compiled our original list of special needs, we never even considered marking “yes” or even “maybe” for hearing loss. I just shudder when I think about the blessing we would have missed! 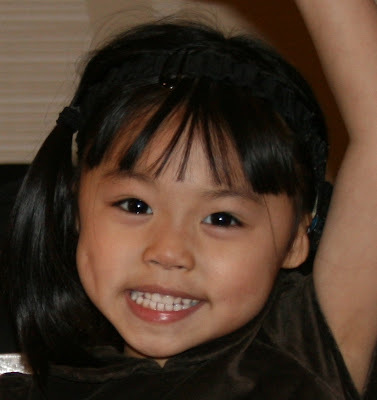 We traveled to pick up our Mia Chu Chu in January of 2007, and we have been amazed by this wonderful, bright, energetic, hilariously funny little girl. Mia’s condition is called “microtia” meaning “small ear.” While her inner ears are in good shape, her outer ears did not completely “bloom,” and she does not have ear canals. Her unaided hearing is similar to our level of hearing when wearing earplugs. She CAN hear us when she isn’t wearing her hearing aid- such as in the bath or at the pool, although her hearing is stronger on one side than the other. But she can really, really hear us with her wonderful hearing aid! Mia wears a Bone Anchored Hearing Aid (BAHA) made by the Cochlear company. We are often asked if she has a “Cochlear implant,” but she does not. Her device is completely external. She wears it on a snug headband (I paid a lot for a cute headband that matches her hair color!). Sound waves vibrate her hearing aid unit, which vibrates her skull bones, which sends great waves into her intact inner ears. She can hear almost everything. Some high-frequency sounds like “f” and “th” are tricky, though, and she does struggle a little more in loud restaurants. At age five, a pin will be surgically implanted into her skull and, after it ossifies, her hearing aid box will snap directly into the side of her head behind her little ears, and she will have about ten MORE decibels than she has now- giving her full access even to whispers and those tricky “f” and “th” sounds. Mia is wearing her hearing aid in this picture; it can be seen behind her left hear. Many parents with microtic children pursue cosmetic surgery, and it is our understanding that there can be extraordinary results. After extensive research and prayer, we have chosen to delay cosmetic interventions until Mia can participate in those decisions. Our focus has been and continues to be on her communication skills. Mia’s language development has been extraordinary. We realized when she first received her hearing aid (she calls it her “tweeter”; isn’t that cute?) that she really didn’t have much of a concept of oral language. We worked really, really hard in those early days to jump-start language. We were probably pretty irritating for others to be around with our constant over-narration, i.e. “Mommy is eating the red apple. Do you see the red apple. A-A-A-Apple. Apple. Can you say Apple? Good!” I’m surprised our friends stuck with us! With God’s help (and Adam’s 🙂 ) Mia is now almost completely caught up with her peers in receptive and expressive language. I now know that it is very common (naturally!) for internationally adopted kids to struggle with language acquisition, and I sometimes wonder if the original “healthy” child we thought we wanted would have struggled more than Mia because we wouldn’t have worked so hard on verbal skills. We are now in-process for our fourth child, our second special needs adoption from China. I see so many kids with microtia – many of whom are only affected on ONE side – on the list. Hearing loss can be a manageable special need! It is our prayer that wonderful kids like Mia will find their ways to loving forever families. We are always available for questions!